New British Airways Executive Club membership cards revealed? Over on Reddit, a user who claims to be a British Airways employee has posted pictures of new British Airways Executive Club membership cards. See below, and click to enlarge. I have cropped the image but it looks as if it was taken from an internal BA system. The original page doesn’t describe the cards as new – it is just part of a general descriptive article on BAEC. This makes me think that the web designer used the image from a library without realising it wasn’t meant to be released. They look oddly Middle Eastern / Moorish in design – if Emirates had released this as a design I wouldn’t have been surprised. Let’s see if these are actually released to members. We had a bit of a spurt a couple of years ago reviewing rail lounges across the UK. My favourite is the GWR First Class lounge at Paddington reviewed here. Here are reviews of Virgin Trains Manchester lounge, Virgin Trains Liverpool lounge and Virgin Trains London Easton lounge. The old Virgin East Coast lounge at Kings Cross – which is unchanged under LNER – is reviewed here. seat61.com reports via Twitter that GWR has opened two new lounges in Penzance and Truro. These are only for sleeper train passengers and have a lounge with showers & complimentary tea, coffee, juice and snacks. This is all part of the new look Night Riviera Sleeper service which you can read about here. There are some photos from seat61 of the Penzance lounge here. Yesterday I wrote about a very good car rental offer between Enterprise Rent-A-Car and Virgin Atlantic. 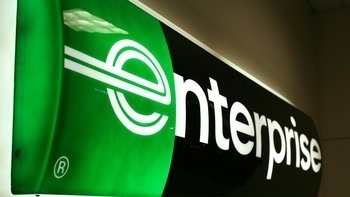 Enterprise is offering 300 Virgin Flying Club miles per day when you rent a car from them. The maximum mileage you can earn is 3,600 miles per rental. This offer is valid at Enterprise Rent-A-Car locations in the UK, Europe and North America. The offer dates were not on the landing page and it seems that Virgin was giving out incorrect information. The promotion runs for longer than I thought. You need to book by 30th November 2018 for rentals ending by 31st December 2018. You need to book via this landing page here (click) which has now been updated with the closing dates. Why you should join the Automobile Association to save ££££'s on hotels! Shame it looks like it now has an expiry date. I’ve been using my officially expired silver status card for the last 18 months without a problem getting through fast track security at various locations. In fact it even works at check-in as well! Rail lounges – I was pleasantly surprised recently to find LNER had lounges in so many of their stations, even what might be considered a rather less important interchange like Doncaster. However, unless you’re travelling from Paddington, GWR don’t have lounges in large stations such as Reading and Plymouth.